It's gorgeous out today and after running errands I just did not want to come inside. I know the novelty of warm, sunny weather will wear off - especially when the humidity moves in (uuggghh!). Until then however, I am really having to force myself to get anything done. Felt guilty because I hadn't posted here yesterday so thought I would look through my vintage pictures file and just throw up a quickie. Found this picture in my files. I'm not sure where I got it from, I do know it is not from my personal collection. 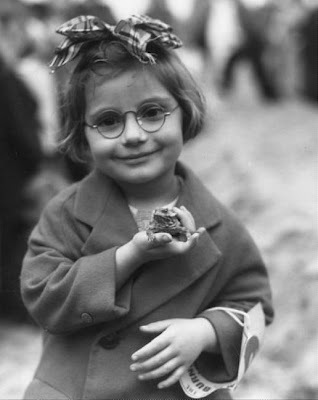 I thought this would be a perfect pic to post, a sweet little girl from the late 30s with her frog friend. Had a whole story worked out about the little girl and her "prince"
Yep, would have been cute, except on close examination (and enlargement of the image), I realized that her frog is actually an iguana, so it doesn't really fit. Cute pic though, so here you have it...from my Friday file. You have to kiss a lot of iguanas before you find your .... shoemaker? Aww Sue! I LOVE this picture---actually, she sort of has a "kindred" feel to her--are you sure you wouldn't reproduce that face somewhere? She is cute! hmmm, a shoemaker Tristan? If it was Manolo Blahnik, that would be okay! Zan, she is such a little cutie. I always wonder when I see vintage pics of little children what the rest of their lives were like. Good I hope. Hmm... not an iguana, maybe a bearded dragon of some kind of fence lizard? Adorable picture. ooops! I really don't know my lizards! Well, you could have fooled me! Thought it was a frog for sure! It is hard to get productive during nice weather. This great picture sums it all up. Enjoy the good stuff while it is here! There will be rainy days to get down to business! It is beautiful here too. sunny and warm and tomorrow even warmer. I was thinking the same thing! I better spend time outside during these beautiful spring days before it gets too humid and once again get stuck indoors in the a/c. I am doing my artwork after dinner now and defintely enjoying being outside all day! Hi, what an adorable picture, so sweet and charming!!!! !, thanks for sharing!!! I need to get back on the bandwagon here! Cute pic! Love the new look. The art doll in the banner is soooooo gorgeous! Sue I love this picture. How adorable is she. that image was once on a blank card from somewhere ... I've sent it to friends ... wait, I'm wrong ... same girl and very similar shot, but she was holding a FROG in the card version ... love her face!